I’ve commented on this blog in the past about evolution (that is, that humans evolved from earlier life forms) and how there isn’t as much support for it in the United States as the rest of the developed world. Much of the opposition to evolution is because of the strong influence of evangelical Christianity which staunchly opposes it because it contradicts its interpretation of its holy text. This interpretation is not universal among all Christians; for example, many Catholics believe in evolution, as do many mainline Protestants. However, evangelical Christians are committed to opposing it. It creates a major credibility gap. The scientific evidence for evolution is overwhelming. It’s not as if there is a debate in the scientific community about whether or not it happened; it did. Instead, the debate is about how it happened and the factors that influenced it. By trying to portray the science as arguing about whether or not it really occurred, rather than the specific factors, the against-evolution movement undermines their own credibility. It makes them look like they are willing to sacrifice clear evidence in order to maintain a specific religious belief that is not grounded in reality. It misses out on some powerful insights. By looking at evolution, Christians who reconcile their beliefs with our own species’ developments gain insights that you just can’t get by believing in a “The world was created as-is” model. I’ll explain what I mean below. I just finished reading the book The Third Chimpanzee by Jared Diamond. In it, he looks at the development of our own species and how similarly we are related to chimps and pygmy chimps. The reason we humans are called the third chimpanzee is because our DNA is 98% similar to chimpanzee and pygmy chimpanzee DNA. We are more closely related to chimps than we are to gorillas; but chimps, too, are more closely related to us than they are to gorillas. The book looks at the evolution of human sexuality, humanity’s great leap forward, and why we get addicted to drugs. However, the part that recently blew my mind what the section on genocide. One of the things that irks me about evangelical Christianity is its insistence of pointing at itself as a compass of human morality but then gets certain things about morality completely wrong! Specifically, it gets genocide completely wrong. There are parts in the Old Testament where God orders the destruction of foreign people by the Israelites. He orders the mass killing of men, women, children, and infants of the Amalekites in Joshua 15:1-3. He also orders the destruction of city after city after city in Judges (it was such a common occurrence that each destruction gets a single verse; only Jericho has more to the story because it is unusual that Joshua left some people alive – for some of the inhabitants helping the Israelites). For any group of people that borders Israel, the Israelites are to destroy every single inhabitant including the animals. For distant cities, they are to kill all the men but can keep the women and children for themselves (Deut 20:10-14). Modern Christians often gloss over these passages, and rightly so. They are hard to read and we usually dismiss them as “Well, that was a different time.” Skeptics challenge Christians to say “How can you believe in a God that orders these types of atrocities?” Christians are frequently forced to demure or say “Only God knows” which is an honest answer, but seems to concede the point to the skeptics in hopes that there is a really good reason for it somewhere out there. Unfortunately, there are some Christian theologians who defend God’s actions. One of these is Norman Geisler, one of evangelical Christianity’s theological All-Stars. He’s written numerous books and appears in Lee Stroebel’s “A Case for Faith.” In the book, Stroebel flat-out asks Geisler how he could believe in a God that order such cruel atrocities. Geisler then gives what I think is one of the most cringeworthy defense in modern Christian apologetics. “God didn’t order any atrocities.” He goes on to say that the Amalekites were evil so God has to destroy them. Furthermore, he even has the audacity to say that it was an act of mercy. That is, killing all the men, women, children, and infants was an act of mercy. When I read that, it makes me angry. It makes me madder than a yak in heat. It makes me angry because genocide is always wrong. It makes me think “What the hell is wrong with you? How can you call something so evil as something that is actually good?” The targeted killing of an ethnic group is not an act of mercy, it is a whitewashing of history; the Israelites wanted the land so they killed the locals and then later rationalized it by saying that God told them to do it. The Bible never makes a mistake. God ordered the genocide of the Amalekites. But notice what happens here – clinging to Biblical inerrancy is more important to Geisler than standing up against genocide. He’d rather maintain his ideology than stand up for morality. And that’s what sometimes makes me so mad about evangelical Christianity – this clinging to ideology. If you can’t even get it right about genocide (which is pretty much black and white) because ideology is more important to you than anything else, how can we trust you to get it right about any other moral issue? How do I know that you’re not blinded by your ideology on every issue? But hold on, it doesn’t stop there. I was reading Jared Diamond’s book and there’s a section on genocide. It turns out that genocide is common in our species’ history. It has occurred time and again before Columbus’ discovery of the New World, afterwards up to World World 2, and even since then (Rwanda in the 1970’s and again in the 1990’s, Cambodia in the 1970’s, Bosnia/Croatia/Serbia in the 1990’s, Bangladesh in the 1960’s, and so forth; there are too many to name). Many of these have over 100,000 victims. It is so common in our species’ history that it can’t be considered an anomalous aberration. It seems to be a regular occurrence (but fortunately is declining according to The Better Angels of our Nature) and is probably encoded in our genes, a byproduct of evolution that we are still living with today. The problem of genocide is that we bystanders are not good at stopping it. Think about it for yourself – out of all the victims of genocide, how many do you identify with? There’s probably only one group – the Jews when they were massacred by the Nazis in World War II. You may also sympathize with the only other group that gets attention these days, the Armenians who were targeted by the Ottoman Turks during World War I. All the other groups we have some sympathy for but not a lot. Why do we sympathize with these two groups? Diamond has three reasons. The first is that the victims in World War II were white, just like us. The second is that the people doing the atrocities were our enemies in war so we are conditioned to hate them. The third reason is that there are articulate survivors in the United States who go to a great deal of effort to make us remember. So that’s depressing. I admit that I don’t identify with too many other groups of genocide survivors other than the victims of World War II. The first is that we humans are good dividing the world into groups of “them” and “us.” We take care of members of our own group and view members of “them” with suspicion. However, over time, attacking people because they are “them” but not “us” has fallen out of favor. The second way that we justify our attacking other people is by blaming the victim. We sometimes use self-defense as a reason for pre-emptive attack. Even Hitler claimed that the Poles were attacking the Germans as a reason to attack Poland. Another way we blame the victim is saying they don’t possess the right race or religion or political belief, or that we are civilizing them. Because they are wrong or backwards, they need to be destroyed so we can cleanse that society. This is one of the reasons that the Germans attacked Russia – because the Russians supported communism. But it’s also a reason that the Khmer Rouge emptied their country of intellectuals – they didn’t believe in the same things the regime believed in and therefore had to be purged. If you read through some of the American leaders’ views on the native Americans, they justified their extermination by saying that they weren’t civilized. The British settlers in Australia said the same thing about the native Aborigines and Tasmanians. They succeeded in eliminating the native Tasmanians in the 1800’s. Look at how Geisler’s defense of genocide perfectly aligns with modern times. He both identifies with the aggressors (the Israelites) by dividing them into “them” (the heathen) and “us” (the chosen), and then rationalizes the genocide by saying that the others didn’t have the right set of beliefs, and denigrated their own customs and cultures. They were not civilized. Geisler’s defense of genocide is not an example of how God’s orders were really an act of mercy, it is instead an example of how people rationalize their own actions even when they are evil, and the patterns Geisler uses are no different than anyone else’s. In other words, Geisler is just another human. But, here’s the thing. My point in all of this is that Norman Geisler is just another human. Evangelical Christianity thinks that these passages are in the Bible and need to be defended as morally right. I have a different interpretation. It’s probably not the right one, but it’s the one I am going to use. These passages are in the Bible as an example of how bad human nature can be – we people are capable of committing acts of evil and then rationalize that they were good by attributing them to God. These acts of evil are part of our nature, they are hardwired into us. Thus, these passages are not warnings to the heathen nations that they are on thin ice with God, but rather that we are on thin ice with ourselves because we are all human. We all inherited the same nature because it’s encoded in our genetic profile. It’s something that has stuck with us from evolution. Time and circumstance has shown repeatedly in our history that this is something we do over and over again. Worse yet, we use God and morality to justify it. These passages show us what can happen if we don’t actively curb these impulses. I think Norman Geisler and evangelical Christianity are wrong to defend these passages as morally good. Instead, we should look at them as a warning to ourselves as that which lurks beneath the surface. If you think these passages mean that God punished the wicked, you don’t know yourself well at all. If, however, you think that either one of these groups of people could have been you, then you know yourself a lot better. Lest you think you and me are off the hook, we’re not. Why don’t we identify with the victims of genocide? The answer seems to lie in the fact that genocide introduces a deep psychological numbing on the victims and the perpetrators. Victims often experience Post-Traumatic-Stress Disorder, and perpetrators become numb to doing it. While attackers at first have to overcome their inhibitions, over time they don’t need to anymore. They are like robots that go through the motions. Trained psychiatrists have a hard time dealing with and after hearing it over and over again, they experience less distress and more distancing of themselves from the stories. If trained professionals can’t handle it, how can we expect the average layperson to deal with it? Yet deal with it we do by rewriting history. We romanticize the old country by envisioning cowboys and indians, something I did (I think) as a kid. But more than that, I think of cultural and anthropological genocide as something my ancestors did, and I was not responsible for. I wasn’t around to do it, even though I’ve benefited by the 90% reduction in native population that resulted from my ancestors landing in this country (or, to be more fair, arriving in the 1900’s to find the land mostly empty – wait, did I just do it again?). After all, what were the natives doing? Were they developing the land? But these rationalizations are how I distance myself from genocide. I am doing the exact same numbing thing that everyone else does. I myself am a normal human. I used to think that since I didn’t agree with people like Norman Geisler that while I may not know everything, at least I didn’t think that genocide could be morally justified. But it turns out that I do distance myself from historical genocides, both in my own country and from the sufferings of others around the world. And that gives me pause. A few weeks ago, I was at my wife’s friend’s place. While we were there, one of the kids there – about 12 years old – asked the following question. Kid: Dad, God made everything in the whole world, right? Kid: Okay, so if that’s true, then who made God? Because it can’t keep going back to having someone create something, because then who created God? It doesn’t make sense. Dad: Well, that’s the big question, isn’t it? Indeed, it is the big question. And fortunately, the question works the same way if you’re religious or if you’re not. If you’re religious and you believe that God created everything, then who created God? The answer is that God required no creator. But then what was God doing before there was a universe, or was God, or was… well, you can see the point. What’s before the beginning? And for the non-religious, it all started with a Big Bang. All matter in the universe was infinitely dense, compressed way together. And then it started expanding rapidly and 13.7 billion years later, here we are. But what was before the Big Bang? When did it all start? What happened before that start point? The answer to that question is that there was nothing before the Big Bang but that’s not any more helpful than asking the question who created God which is the same way of asking what was before God? Asking that question hurts my brain. I can’t even imagine what was before the beginning because presumably that’s when time began, too, as time is a way that we measure events relative to each other. But what if there’s no time? Some questions don’t get any easier as we get older. On Facebook, I have many friends who are religious and friends who are completely irreligious. I have noticed that the irreligious ones are far more prone to posting religious rants than the religious ones. For not believing in a higher power, they sure can be preachy sometimes. I do have some Christian friends that like to post pictures or articles countering a particular viewpoint about Jesus in the New Testament and how he isn’t like Personality Trait A, B, or C. Instead, we should believe in Jesus as he really is. This isn’t just something on Facebook, though. There are numerous books and videos that make the same points – the modern church interprets Jesus that best fits our current lifestyles, and not what he really taught which would make us much less comfortable. I think that everybody has their own particular interpretation of religion, and consequently, who Jesus is and what he stood for. When people hear a particular religious belief, they articulate it in their own words when they repeat it to others, but also when they repeat it to themselves. Thus, I don’t hold it against anyone when they interpret the message of Jesus in the light of their own personal experience. But there is one thing I do take issue with – when my Facebook friends or other Christians post articles claiming that Jesus wasn’t a political revolutionary and that he was more interested in matters of the “heart” (i.e., how people relate to one another and how we relate to God) rather than matters of politics. If Jesus answers yes, then the religious leaders can say he’s perfectly okay with the foreign occupiers of Rome occupying the Holy Land. But if he says no, then the religious leaders can say that Jesus is advocating not paying taxes to Rome which they can take to the Romans so they can arrest Jesus as a revolutionary. Many people take this as clear evidence that Jesus was okay with the government of the day. Furthermore, my Facebook friends use it as further evidence that Christians should not get involved as politics. Just as Jesus advocated that it was right to pay taxes to Caesar (by giving him that which is his, i.e., taxes decreed by legislation), we should give to God the things that are his since those are more important. After all, if Jesus wanted to say we should rise up against the government, that was his chance to do so! Ergo, Jesus was not a political revolutionary in any sense. And neither should we be. Except that I think that interpretation is completely wrong. Indeed, I think that this verse does show that Jesus was a political revolutionary, the exact opposite of what some (most?) think it does. John the Baptist was a fiery preacher that preached that the Kingdom of God was at hand, and Jesus was a follower of John the Baptist for a time. The Jews believed this Kingdom was a literal kingdom on earth. Jesus tells his disciples that they would sit on 12 thrones judging the 12 tribes of Israel (Matt 19:28). Jesus tells his disciples that some of them would not taste death until they saw the Kingdom of God come with power (Mark 9:1). During his trial, Pilate asks Jesus if he is the king of the Jews, and Jesus answers in the affirmative (Mark 15:2). Jesus entered Jerusalem the week before his crucifixion while the crowds proclaimed him the Messiah (Matt 21:1-11). It is while Jesus was in Jerusalem (after bullet point 5) that he cleanses the Temple by overturning tables, and then has the Caesar/taxes showdown with the religious leaders. These verses above, and many of the rest of the passages in Matthew, Mark and Luke, show that Jesus taught a literal kingdom of God on earth, not “merely” in heaven (just like in the Lord’s prayer, as it is on earth in heaven). A literal kingdom of God on earth meant that there was no room for Rome. Indeed, Rome would be booted out when God meted out justice. So where does this leave Matthew 22:21? According to the Greek, the words “render unto” means to give back because it’s theirs. They are entitled to receive because they are the rightful owner of the thing being paid. In other words, Caesar is entitled to receive back his coin because it’s his picture on the coin. He can have it. But God is entitled to get back the land because it’s His land; the Romans are occupying it (“the land is mine”, says the Lord in Leviticus 25:23). I paraphrase it this way – Give Caesar his coin back. God gets his land back. That is the exact opposite of the interpretation that Jesus is perfectly fine with paying taxes to the occupying government. Instead, this passage is saying that it’s not okay to pay taxes to a government that is against God, and instead we should strive to ensure that God’s will is done if it means kicking that government out! Lest you disagree with this interpretation, the Pharisees used this as evidence to get Jesus arrested, and Rome executed Jesus because they believed he was an insurrectionist – that he was going to lead (or was leading) an uprising that would try to usurp Rome. That doesn’t mean I agree with my Christian friends who are all about mobilizing voters and pushing through legislation that supports their causes. Modern day America is quite far removed from first-century Palestine. Instead, I use this story to say that I definitely disagree that Jesus’s message was apolitical in nature as demonstrated by this passage, because it wasn’t. One of the doctrines espoused by some of my more conservative Christian friends is complementarianism – the belief that men and women “complement” each other but have unique roles within the church. This belief system states that women cannot hold positions of leadership in the church (no women ministers, deaconesses or elders), nor can women hold teaching positions in the church where they would oversee men (teaching kids is okay). When I was growing up, I heard a little about this but it didn’t come up very often. In church, I frequently had Sunday School teachers that were women and I thought nothing of it. The pastors and deacons of the church were men but I didn’t think anything of that, either. I thought that men were pastors because (a) women didn’t want the job, and (b) leaders tended to be men in most areas of life anyhow. This view wasn’t really enforced until one time in my late teens, a Sunday School teacher reiterated this position and said that women and men are equal in value, but unique in roles. This is the only time I ever heard it explained this way. I don’t think that this view is reflective of most people in that church, but it was reflected in this particular teacher. I’ve been in numerous churches and this rule is not enforced everywhere. There are some churches that have women pastors, and others that do not. Even the ones that do enforce it don’t enforce it, it’s more of a convention. Their view on this teaching is that it was more of a cultural thing at the time these biblical passages were written. However, I have a few friends who actively enforce this position. Women cannot be pastors, elders, or teachers. They are adamant about this. These are hard-and-fast rules dictated by God, to be followed for all time. Churches who are soft on this are… soft (this is my perception of their beliefs). Furthermore, they can quote all sorts of studies that “prove” their views are correct. Women are more interested in child care than men. This is true in all cultures. Men are more competitive than women. This is true in all cultures. Men are better at abstract reasoning than women (i.e., manipulate shapes in their head). Women are better at language than men. Thus, I believe that men and women are not the same with artificial constructs put on us by society. We naturally gravitate to different domains. However, that doesn’t mean that women cannot be leaders. We have many women heads of state and leaders of large businesses (e.g., German Chancellor Angela Merkel, former Secretary of State Hillary Clinton, and Facebook COO Sheryl Sandberg). Conversely, men can provide childcare and some are very good at language. Thus, while many women don’t want leadership positions, some do. And some would be good at it. Most women probably wouldn’t want the positions of church leadership (many men do; it’s the testosterone that drives us to take leadership positions in general). But some do; because of genetic variance, closing leadership positions off to 50% of the population doesn’t make sense to me. You’re losing the opportunity to learn from good people. That’s one reason I don’t agree with the hard line position. My hard line friends probably would agree with me that some women may be good leaders or teachers in church. But it doesn’t matter – the Bible says that they can’t. That settles it. And here’s a whole bunch of reasons why they can’t. The people who wrote the passages saying that women could not be teachers or leaders were men. The people who now say that women can’t be leaders are men. The people who write modern interpretations proving that women cannot be leaders are men. In other words, the people who deny the positions of authority to women are men in positions of authority. I can’t remember seeing any women writing books or blog posts that say “Women, we can’t be teachers or leaders! So let’s learn to live in our roles.” That just doesn’t happen at the same scale that men make the reverse claim. Humans have something call the self-serving bias – we interpret events in a ways that benefit ourselves. For men to interpret a passage in a way that benefits them is unsurprising because that’s the way all of our brains are built. But it doesn’t make it correct. The term “complementarianism” sounds like a mechanism that was created to justify inequality by attaching an official term to it. Men and women complement each other, and therefore should have different roles. These roles are equal in value, but unique in nature. Just because women can’t be leaders, this does not mean that they should be valued any less or that their roles are less important. Yes, it does sound sexist. Is it really? Or not really? Black people and white people are equal in value, but black people cannot be leaders or teachers in the church. But just because black people cannot be leaders, they should not be valued any less. It sounds racist, but it really isn’t. Yes, it is racist (or, it would be if that doctrine existed). You can insert any two races in there and it would sound racist because it is racist. It’s not really “not racist” because of a clever re-interpretation. It doesn’t matter what two groups of people are in those two classifications, one will appear to be subservient to the other because that’s what the text implies. Thus, when I say that the rationale “feels” wrong, what I mean is that the text sounds like one group of people is subservient to the other and no linguistic gymnastics gets you out of it without resorting to mental biases to creatively re-interpreting things. That’s why I think the hard-line stance of complementarianism is wrong. The last part of Hinduism I want to talk about is coming back full circle to the questions I had at the beginning. What’s the deal with the religious ceremonies? Why did the Hindus have a religious ceremony at the top of Mt. Batur? My theory is that this is a form of bhakti yoga, the way of devotion. It is the self-surrender to one of the gods through acts of worship (the ceremony), ritual (burning incense) and pilgrimage (climbing the mountain). What about the stone carvings outside the home? I think that this is part culture but also partly about the religion. Hindus are free to choose their own gods and through acts of worship – bhakti yoga – they can achieve moksha (salvation). I don’t know how seriously they take this. Do they really believe in devotion to the gods? Or is it socially reinforced? What about the sacrifices Hindus make outside their homes three times a day? We saw these sacrifices everywhere outside people’s homes. I think this is bhakti yoga which has rituals and sacrifice as part of its ordinates. However, it also plays to dharma. Hindus believe that they must repay their debt to the gods for their blessings, and this is done through rituals and offerings. 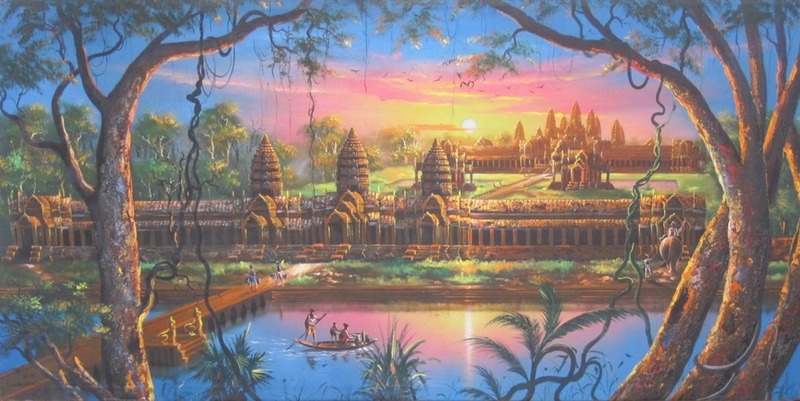 Angkor Wat was built by King Suryavarman and dedicated to the Hindu god Vishnu. Once again, I think this is a form of bhakti yoga. The king was showing his total devotion to Vishnu, and perhaps trying to minimize his bad karma. Does yoga in the west have anything to do with the Hindu version of yoga? This past weekend, I saw a yoga place called “Moksha yoga” which means “salvation meditation.” However, yoga in the United States is basically a way to stretch and gain flexibility. There’s nothing in it to minimize your bad karma, achieve knowledge, or devote yourself to the gods. What is the deal with that 20 foot angry monkey? I can’t figure this one out. I didn’t get the sense in Hinduism that the gods are angry. And that concludes my series on Hinduism. I thought I would wrap up my summary of Hinduism with some odds and ends about it. Namaste is a greeting where you bend your elbows, fold your hands, bow and say “namaste.” It is a way of saying “I bow to you”, that is, negating or reducing one’s ego in the presence of another. I can’t remember if we saw this in Bali or not, but I saw it all the time at the hotel we stayed at in Cambodia. 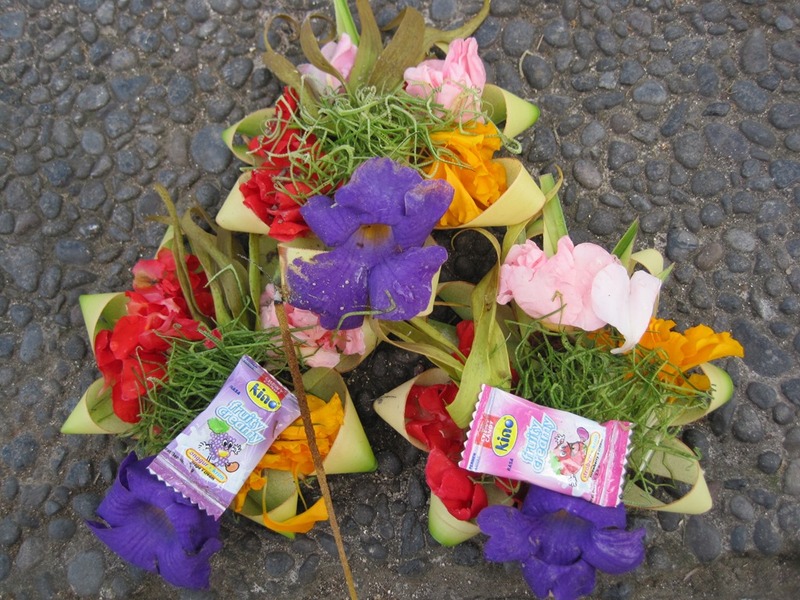 Cambodia is primarily Buddhist, but perhaps this tradition was inherited from Hinduism. Even though I have heard of castes all the time, I didn’t find a lot about it when reading about Hinduism. Technically, there is a fifth class – the untouchables. These are people whose jobs are very low such as people who deal with human waste (e.g., sewer workers) or garbage collectors. In India, there used to be a strict enforcement by birth in previous societies although today it is mostly downplayed. It was officially abolished in India in the 1940’s. I’m not sure what led to its importance in society although it was probably used as some sort of way of creating order in society, even though it was unfair to the lower classes, and bestowed undeserved status upon the higher classes. Castes are still used to arrange marriages. Parents of the same class will often get together to marry off their children. Even though in the west we think we don’t do the same, we do. It’s just not intentional nor reinforced culturally. According to most sociological studies, most people marry within the same class. The “rags to riches” story is romanticized in the west but occurs rarely. Karma yog – The way of self-less works. This was described in my previous post about karma. You minimize your bad karma to increase your good karma, and eventually you break the cycle of samsara and your atman merges into Brahman. Jnana/jyana yog – The way way of knowledge. This type of yoga dethrones ignorance and achieves a state of consciousness where we realize our identity with Brahman. It is done through deep meditation as part of yoga. This is what we westerners often associate with yoga – deep meditation. Bhakti yog – The way of devotion. This is the self-surrender to one many gods of Hinduism through acts of worship, rituals and pilgrimages. The majority of Hindus practice this mode of Hinduism. So where does this number come from? In the Vedas, 33 deities are listed followed by the Sanskrit word koti which is used for “class” but can also be a number meaning 10 million. Some believe this is a misinterpretation of the actual meaning of the word (i.e., 33 classes of gods vs 33 x 10 million gods). Others think that 330 million is a large number indicating infinity, i.e., there are indefinite forms of Brahman. Still others think that the number 10 million was the largest number the original writers had at the time, and that there were 10 million living things and that all of these living things were representations of Brahman. In any case, the original Vedas most likely don’t claim 330 million gods but instead that Brahman can be represented many different ways. Continuing on in my series about Hinduism, here are some more of my notes. Dharma means “law”, “teaching”, and “religion”. It is one’s destiny or purpose. It is often defined by vocation or career. If a man’s father is a tire maker, his purpose is to make tires. – Debt to the gods for their blessings: Paid by rituals and offerings. – Debt to parents and teachers: Paid by supporting them, having children of one’s own and passing along knowledge. – Debt to guests: Repaid by treating them as if they were gods visiting one’s home. – Debt to other human beings: Repaid by treating them with respect. – Debt to all other living beings: Repaid by offering good will, food or any other help that is appropriate. Looking at these, everything that people do in response to these debts – the actions they produce – are good things. Treating people with respect is good. So is offering good hospitality. In Hinduism, behaving morally is built into the religion as something you need to do. Christianity is different. These same behaviors are viewed as moral in Christianity, but whereas in Hinduism they are required to repay your debts, in Christianity they are quasi-optional although this depends on the denomination of Christianity. Christian belief is by “faith alone”, that is, what makes you a Christian is what you believe. Afterwards, you are expected to do good works and behave morally. Doing these good works is not required but instead is an outward sign that you have changed and are living your life according to God’s (optional?) moral commands. I use the term “optional?” because while you don’t have to do them, if you don’t people will question whether you actually made a commitment to become a Christian since a real Christian “naturally” wants to become more like Christ, and becoming more like Christ means following his teachings which is to behave morally. So they are more than “optional” but not quite “required.” But it’s close. It’s complicated, so I’ll move on. The point is that in both religions, good works are required. BTW, after learning about dharma, the name Dharma Initiative from the TV show LOST makes no sense. It had nothing to do with this. Artha means Prosperity. It is success in worldly pursuits. While the ultimate goal of Hinduism is enlightenment, pursuit of wealth is seen as appropriate in this lifetime. This strongly contrasts from most religions, not just Christianity where the pursuit of wealth is not actively encouraged. Kama means Pleasure, and also means Desire. It is romantic love and sexual pleasure. It is seen as appropriate to pursue. This is where the term “kama sutra” comes from. Moksha means Enlightenment. This is the ultimate goal of Hinduism. It is the liberation from the endless cycles of rebirth (due to reincarnation). It is self-realization or awareness or union with God/ultimate reality (sometimes said to merge into nirvana). I did a bunch of reading on this and the descriptions of moksha are vague. It is not exactly like the Christian concept of heaven. Once you achieve moksha, you escape limits of worldly existence like time, space, and karma. It is the highest purpose in life, but it is difficult to achieve in a single life time.